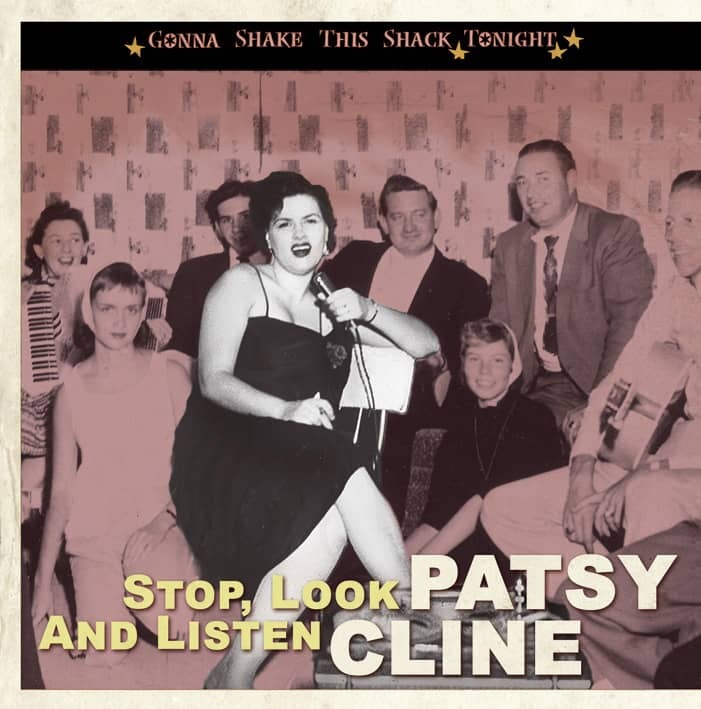 To the general public, Patsy Cline's name and legend will forever be linked to four crossover pop hits and her tragic death in that infamous private plane crash on March 5, 1963. Savvier listeners say her legacy rests on the creamy, flawless ballads she recorded for Decca between November 1960 and February 1963. But what if a frustrated, disheartened Patsy Cline never recorded another note after her 4-Star contract expired in 1960? Those obsessed with trade charts would tab her as the 'one-hit wonder' who spent a career seeking that elusive follow-up to Walkin' After Midnight. But country and rockabilly collectors would rank her among the era's greatest dynamic female singers, ranking alongside of Charline Arthur, Wanda Jackson, Brenda Lee, Rose Maddox, Janis Martin and Kay Starr. Sure, the ballads Cline was handed in the studio between 1955 and 1960 were mediocre at best, embarrassing at worst. But her brassy, nicotine-fueled vocals absolutely shine on the uptempo material reissued here. 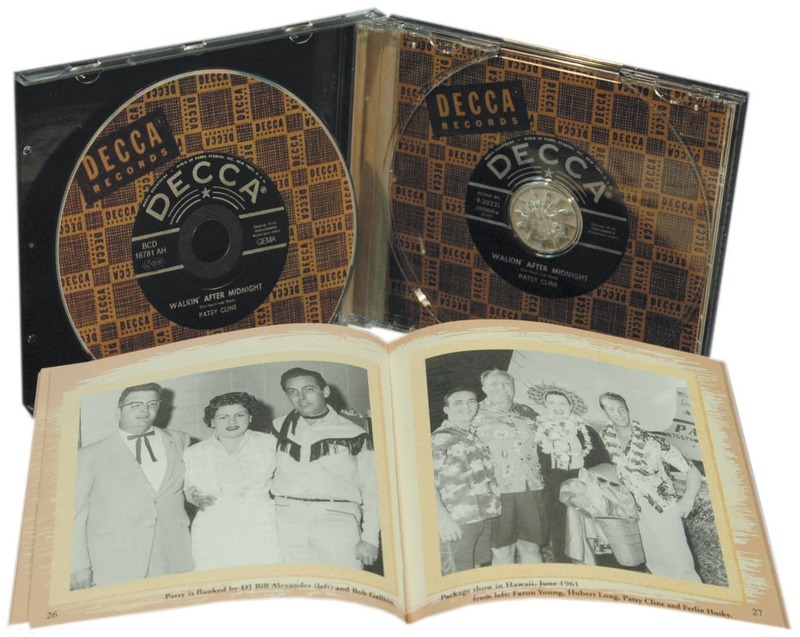 Arguably these recordings – not the lush, later Decca productions that Owen Bradley midwifed – reveal the 'true' Patsy Cline. 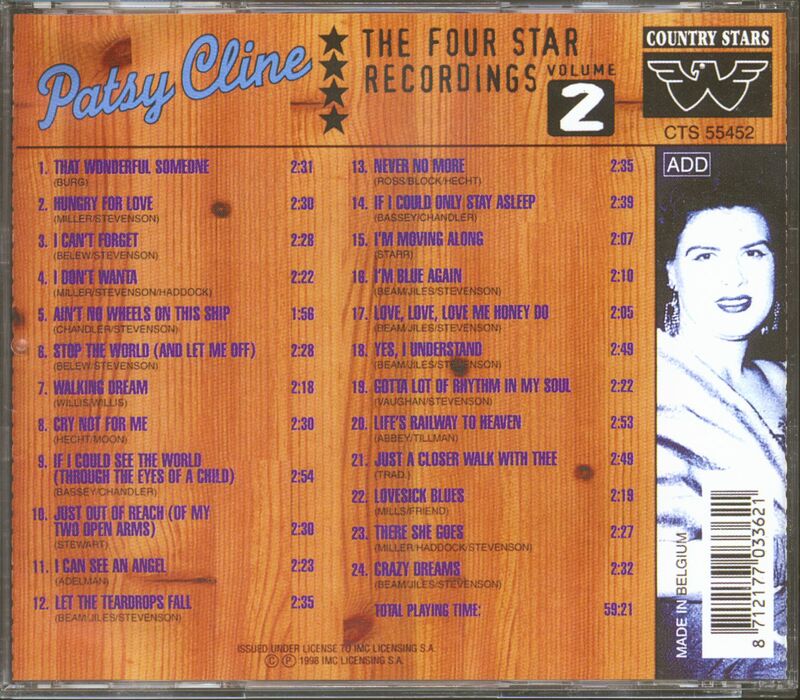 Cline's story has been told often, most notably in Margaret Jones' definitive biography 'Patsy: The Life And Times Of Patsy Cline' (HarperCollins, 1994), Ellis Nassour's earlier 'Patsy Cline' (Leisure, 1981), and Paul Kingsbury's notes for a now-deleted MCA box set, 'The Patsy Cline Collection'. In a nutshell, she was born Virginia Patterson Hensley September 8, 1932 in Gore, Tennessee. Encouraged by an older half-sister, she taught herself piano as a child. The family moved to Winchester, Virginia, where she made her radio debut over WINC in 1948. Impressed by her talent, gospel singer Wally Fowler suggested she try out for the Grand Ole Opry, but her young age kept her off the Ryman stage. She allegedly took the stage name 'Patsy' from WLS singer Patsy Montana, although some claim it was a childhood contraction of her middle name. By 1952 she began singing with Bill Peer's Melody Boys, dressed in a flashy cowgirl outfit sewn by her mother. In March 1953 she married construction worker Gerald Cline, reportedly to ward off Peer's constant advances. When Washington, DC record producer Lillian Claiborne became her manager in 1954, she arranged for Cline to record about a dozen songs at Ben Adelman's local studio. Adelman had some connections in the music industry. A year earlier he placed Jimmy Dean's Bumming Around with Bill McCall's 4-Star Records, scoring a #5 Billboard country hit. Impressed by Cline's bold performances, Adelman brought Cline's demos to McCall's Pasadena 4-Star's offices. McCall saw potential in the singer, signing her to a two-year contract in September 1954. The terms were ethically questionable, calling for sixteen releasable sides, paying $50 per master plus a royalty of 2.34 percent of a record's retail price. As biographer Margaret Jones noted, this was less than half [of ?] the going royalty paid by most labels. "That meant if she had a modest hillbilly hit of 25,000, the most she would stand to make after all the standard deductions would be $440," Jones wrote. Far more ominous was McCall's fine print: "The musical compositions to be recorded shall be mutually agreed on by you and us, and each recording shall be subject to our approval as satisfactory, for manufacture and sale." In a nutshell, Cline could only record material owned and administered by McCall's publishing companies. McCall's one-year 'option to renew' clause also proved problematic. "When she was broke, she would call McCall and ask for an advance against future royalties," Jones explained. "McCall would give her money but would require an extension on her contract." Cline renewed her contract three times between March 30 and November 29, 1956, tying her to 4-Star into summer 1960. D issatisfied with the Adelman tapes, Cohen asked Cline to record a demo session in Decca's New York studios, backed by Peer's Melody Boys. Cline cut four songs at this November 1954 session. How Cohen responded to these now lost tracks is uncertain. Ellis Nassour claims that Cohen wanted to buy Cline's contract outright, but McCall refused his offer. While conceding that this demo session helped secure the Coral contract, Jones says that Cohen was dissatisfied with what he heard. Believing the singer would be better served by Nashville sidemen, Cohen arranged to have Cline record at Owen Bradley's Film and Recording Studio on June 1, 1955. Although the exact personnel is unknown, musicians on this session are generally believed to be Grady Martin and Harold Bradley, guitars; Tommy Jackson, fiddle; Don Helms, steel; Bob Moore; bass; Farris Coursey, drums; and Owen Bradley on piano. Four songs were recorded, two of them ballads 'co-written' by W.S. Stevenson, actually a Bill McCall pseudonym lifting William Shakespeare's initials and Robert Louis Stevenson's last name. Cline shined on the two upbeat numbers heard here, Turn The Cards Slowly and Honky Tonk Merry-Go-Round. Cline's first two Coral releases showcased the ballads, relegating her livelier songs to the flip sides. Neither single dented the charts. Meanwhile, Cline's career was on the rise, thanks to her association with Washington, DC-area broadcaster and promoter Connie B. Gay. Cline became a semi-regular on Gay's daily 'Town & Country Time' radio and television shows. In September 1955 she was featured on Gay's 'Town & Country Jamboree,' a live Saturday night extravaganza hosted by Jimmy Dean. By year's end the show emerged as the region's most popular musical showcase, reaching an estimated 500,000 viewers. In January 1956 Cline returned to Bradley's Nashville studio for her second session. .. Customer evaluation for "The Four Star Recordings Vol.2 (CD)"